A girl named Martha (Elizabeth Olsen) is seen leaving a country property. She takes to escaping through the woods, reaching a gas station where she makes a desperate call to her sister Lucy (Sarah Paulson). Waiting for a ride, she is intimated by a bloke who saw her leave the property. When she is taken in by her sister and her partner, Martha's behaviour is abnormal and she becomes increasingly paranoid that whoever she escaped from is still after her. In flashbacks, Martha is shown entering a cult community, led by the persuasive Patrick (John Hawkes). He encourages her to be a part of their society and she submits herself and others to the group's perverse sexual rituals. Yet the eventual irrationality of the group sends Martha on a downward spiral. Her paranoia in the present day though begs whether anything she recalls was real or just an imagining. I've worked out what Martha Marcy May Marlene is about. But what about that scene that might have been just a dream or the film's abrupt ending? While you may think you are on safe ground, this is a film that leaves an itch in the back of your mind, asking what scene A means to scene D. Take note of some early vision in the film, which I think is the key to Martha's highly fragmented narrative. A long shot frames Martha leaving the property and into the woods, reflecting her isolation and disconnection to the world. Remember who follows her out of the house, or more importantly, who doesn't. This is a cleverly constructed thriller by writer/director Sean Durkin because it baits you with these kinds of clues, which are satisfying to decrypt when the film refuses to give any solid answers. The film has its share of stumbles early on though because a crisis of some kind has already occurred off-screen, meaning that a lot of the tension in Martha's story has already been spent. 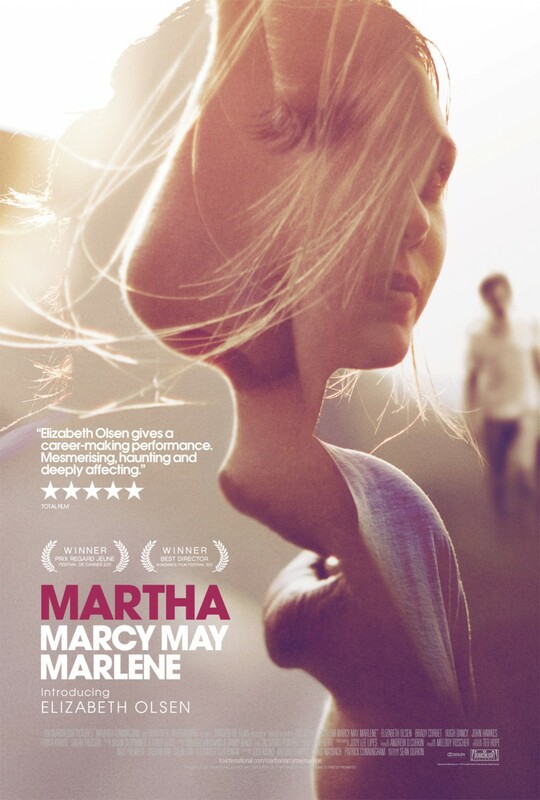 Nonetheless, the film grasps our interest when Martha asks her sister if she has ever had a moment where she can't tell if she is recalling a memory or if she is dreaming. Suddenly, the scenes in the past, juxtaposed against images of Martha sleeping or waking up in the present, hold new meaning. Not only do we question if the flashbacks are real but also if they are representative of a different personal conflict, given that Martha keeps telling her sister she had an argument with a boyfriend. Therefore, the non-linear story is not a gimmick but an intelligent method of integrating character and structure together. It characterises the dislocation faced by an individual, caught between an uncertain past and the inadaptable nature of the present world. After a slow start, the narrative continues to grow, reaching tension levels of almost unbearable peaks. This on the back of a well-cast Olsen (the younger sister of Mary-Kate and Ashley), whose subtle, naturalistic performance makes Martha a deeply remote and alienated figure. Watch her eyes carefully in a late party scene and you'll realise the quality of the relationship here between an actress and a director. Moments like this, along with her breakdown scene, and her shifts between her optimism for the society and her strange behaviour, make this one of the major breakout performances of 2011. With an obtuse role, John Hawkes does remarkably well to find something unique in his character. He allows Patrick to be incredibly persuasive and someone who knows how to tap into people's pain and emotions. He is a very careful manipulator, as shown in the way he talks to his group during a target practice session, calling Martha a leader and a teacher. Presumably, the lack of a specific ideological basis for his community is to strengthen the possibility that it is a dream. Most bizarre is his use of sexual submission on the girls of the cult. One of the girls describes it as a state of cleansing so we assume that it evokes emotions of sexual belonging. You still have to wonder how people could reach such a mental state of acceptance, which further suggests that this is a dream world. Along with the two lead performances that give the film pivotal conflict, there's a very chilling scene involving a break-in that doesn't end the way you think it will. It's a very rattling and upsetting moment, directed with maximum impact. It must also be noted that the film ends suddenly, which is at first frustrating, but also true to its dependency on ambiguity and paranoia. The most interesting films in 2011 allowed audiences to delve into uncertainty, drawing meaning from sophisticated formal qualities. This is one of them because you will be thinking about it for days afterwards, asking how A connects to D. Or was it B?